If you are looking for information on the Whataburger franchise business opportunity, Whataburger franchises or Whataburger franchising, then you have come to the right place. 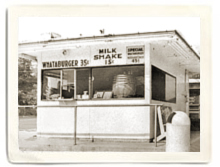 Way back in 1950, an adventurous and determined entrepreneur named Harmon Dobson opened up the world's first Whataburger on Ayers Street in Corpus Christi, Texas. He had a simple goal, to serve a burger so big that it took two hands to hold and so good that with one bite customers would say, "What a burger!" He succeeded on both accounts and turned that one little burger stand into a legend known throughout Texas and the South. Today, each and every Whataburger is made to order, right when it's ordered. And they're still made with 100% pure American beef and served on a big toasted five-inch bun with all 'the extras' to suit your taste. Grilled jalapenos, extra bacon, three slices of cheese, no tomatoes, extra pickles? No problem, your Whataburger will be made just like you like it 24 hours a day 7 days a week. More than half a century later, with Harmon's son, Tom, at the company helm, Whataburger still remains family-owned and operated. Employees at Whataburger are even referred to as Family Members and it is the privilege and promise of each and every one to uphold the tradition that Harmon began. 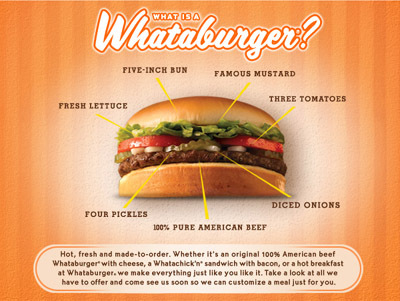 So now with nearly 700 Whataburger restaurants across ten states, road-trippers and hometown folks alike continue gathering under the big orange and white roofs for the fresh made to order burgers and friendly service.